"Who are you people, really?" This remastered, full-length director's cut of the surreal Wojciech Has experiment known as The Saragossa Manuscript is a fitting treatment of his grandiose attempt at adapting the weighty novel written by Count Jan Potocki (1761-1815). Clocking in originally at a healthy three hours, Has saw his film mercilessly cut into a 120-minute version for the US release in 1965, which no doubt made the already complicated tale even less intelligible. It did, however, find an audience among the counter-culture, where pot and LSD seemed to fill in the cracks made by the edits. Grateful Dead guitarist Jerry Garcia, himself no stranger to mind-altering experiences, was a big fan of this film, and this restored version is dedicated to him. 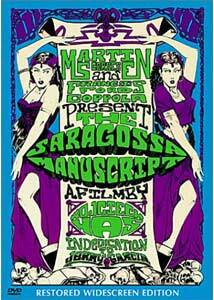 Imagine a blend of The Adventures of Baron Munchhausen, Groundhog Day, and 1001 Arabian Nights and you just may begin to get an idea of what The Saragossa Manuscript is all about. The story opens in the days of the Napoleonic wars, and the discovery of an ancient book, which immediately captivates both a French and a Spanish officer. The pair begin to read, and are soon drawn into the story of Captain Alfonse van Worden (Zbigniew Cybulski), whose adventures are chronicled in its pages. His attempts to cross Spain, which is rumored to be populated with an assortment of ghosts, demons and other nasty things, is only the first of van Worden's problems, as he awakes beneath the gallows, surrounded by bleached bones. As van Worden wanders the Spanish countryside, he encounters a menagerie of strange, otherworldly people, including most memorably a pair of lusty spirits, Emina (Iga Cembrzynska-Kondratiuk) and Zibelda (Joanna Jedryka) who are definitely not what they seem. No matter who he encounters, the problem is that it's not long before van Worden awakes once again and finds himself underneath the gallows on the way to Madrid. The Saragossa Manuscript is a long, twisty collection of stories-within-stories, that occasionally loop back on one another, creating a sometimes confusing array of characters. The narrative is admittedly a bit rough to keep straight at times, but Has accentuates the film with a steady stream of striking visuals, giving the story a pleasant dream-like feel, which I can only imagine was heightened if viewed under the influence of LSD. I can't fully say I understood all of the little stories, but I did enjoy the way Has decorated the tales in some extremely appealing visual wrappers. Image Transfer Review: Presented in a 2:1 anamorphic widescreen transfer, The Saragossa Manuscript is now in what is probably the finest condition it has ever been in. The Pacific Film Archive used the last remaining print of the complete three-hour version, and with a financial blessing from film preservation advocate Martin Scorsese, was able to complete the restoration in 1997. The surreal images have a fairy-tale look to them, something only black & white can offer. Some scratches and nicks are evident, but the widescreen transfer is generally very crisp, with good, overall detail. Audio Transfer Review: The mono audio track is presented in Polish, with optional English subtitles. Dialogue is clean, and Krzysztof Penderecki's regal score sounds wonderful, despite the limitations of mono. Krzysztof Penderecki's score is offered as an isolated music track, and though there are plenty of silent gaps, it does sound much better than the typical mono mix. The real gem is an eight-page booklet outlining the history of the film, written by film historian Darren Gross. This booklet is quite informative, and would be a good primer for those unfamiliar with the story. A brief stills gallery, consisting of eight photos, and a whopping 44 chapters are the other supplements. "What a long, strange trip it's been."